We love gaming. Sure, tech gaming is fun, but there’s nothing as warm as a family game night. And around here, family game night often spills over to family game TIME. So this afternoon, with 15 minutes before naptime/rest hour, I grabbed a new one: Catch the Match by Playroom Entertainment. This simple game includes 15 cards, each with the same 15 images. But each image is a different mix of colors, so that when you line up 2 cards, only one of the images will match. (Example, the duck on cards 2 and 7 may be the exact same colors, but on 2 and 8 have different colors.) The concept, though hard to explain, is simple to master. With a goal of finding the match before your competitor, you’ll find yourself searching the cards silly. In addition, we tried Hop to It today. This memory game, also recommended for ages 5 and up, was a bit more challenging. In this game players must look ahead and remember what they saw before. The 5 year old was instantly frustrated. I even found it difficult to focus and remember. A great game to teach a very difficult concept, I’d recommend it for kids a bit older than 5. 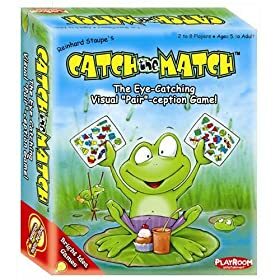 Get it, along with many other Playroom Entertainment games, at funagaingames.com. « Chicco Polly Highchair: Polly Want a Cool Highchair? Games are a great way to bond with family members and make them sharper! Playing games fully engage our minds – intellectually, socially and emotionally while creating connections with one another and building community. Games teach logic, manners, patience, subjects such as math, history, geography as well as building self-esteem. Games not only raise the IQ in our young, they build denser webs of neural connections that can last a lifetime keeping our minds sharp and delaying diseases such as dementia and Alzheimer’s well into old age or for a lifetime… go to http://www.gamesforeducators.com for more information about the value of games.